For his son, author of Cheaper by the Dozen, see Frank Bunker Gilbreth Jr.
Frank Bunker Gilbreth (July 7, 1868 – June 14, 1924) was an American engineer, consultant, and author known as an early advocate of scientific management and a pioneer of time and motion study, and is perhaps best known as the father and central figure of Cheaper by the Dozen. Both he and his wife Lillian Moller Gilbreth were industrial engineers and efficiency experts who contributed to the study of industrial engineering in fields such as motion study and human factors. Gilbreth then became a building contractor, then an inventor with several patents, and finally a management engineer. He eventually became an occasional lecturer at Purdue University, which houses his papers. Gilbreth discovered his vocation as a young building contractor when he sought ways to make bricklaying faster and easier. This grew into a collaboration with his wife, Lillian Moller Gilbreth, who studied the work habits of manufacturing and clerical employees in all sorts of industries to find ways to increase output and make their jobs easier. He and Lillian founded a management consulting firm, Gilbreth, Inc., focusing on such endeavors. They were involved in the development of the design for the Simmons Hardware Company's Sioux City Warehouse. The architects had specified that hundreds of 20-foot (6.1 m) hardened concrete piles were to be driven in to allow the soft ground to take the weight of two million bricks required to construct the building. The "Time and Motion" approach could be applied to the bricklaying and the transportation. The building was also required to support efficient input and output of deliveries via its own railroad switching facilities. Gilbreth, one of the founders of industrial engineering, used "cost-plus-a-fixed sum" contracts in his building contracting business. He described this method in an article in Industrial Magazine in 1907, comparing it to fixed price and guaranteed maximum price methods. Gilbreth married Lillian Evelyn Moller on October 19, 1904, in Oakland, California; they had 12 children. Their names were Anne Moller Gilbreth Barney (1905-1987), Mary Elizabeth Gilbreth (1906–1912), Ernestine Moller Gilbreth Carey (1908-2006), Martha Bunker Gilbreth Tallman (1909-1968), Frank Bunker Gilbreth Jr. (1911-2001), William Moller Gilbreth (1912-1990), Lillian Gilbreth Johnson (1914-2001), Frederick Moller Gilbreth (1916-2015), Daniel Bunker Gilbreth (1917-2006), John Moller Gilbreth (1919-2002), Robert Moller Gilbreth (1920-2007), and Jane Moller Gilbreth Heppes (1922-2006); there was also a stillborn daughter (1915) who was not named. Gilbreth died of a heart attack on June 14, 1924, at age 55. He was at the Lackawanna railway station in Montclair, New Jersey, talking with his wife by telephone. Lillian outlived him by 48 years. Main articles: Time and motion study and Gilbreth, Inc.
Gilbreth served in the U.S. Army during World War I. His assignment was to find quicker and more efficient means of assembling and disassembling small arms. According to Claude George (1968), Gilbreth reduced all motions of the hand into some combination of 17 basic motions. These included grasp, transport loaded, and hold. Gilbreth named the motions therbligs — "Gilbreth" spelled backwards with letters th transposed to their original order. He used a motion picture camera that was calibrated in fractions of minutes to time the smallest of motions in workers. Their emphasis on the "one best way" and therbligs predates the development of continuous quality improvement (CQI), and the late 20th century understanding that repeated motions can lead to workers experiencing repetitive motion injuries. Gilbreth was the first to propose the position of "caddy" (Gilbreth's term) to a surgeon, who handed surgical instruments to the surgeon as needed. Gilbreth also devised the standard techniques used by armies around the world to teach recruits how to rapidly disassemble and reassemble their weapons even when blindfolded or in total darkness. The work of the Gilbreths is often associated with that of Frederick Winslow Taylor, yet there was a substantial philosophical difference between the Gilbreths and Taylor. The symbol of Taylorism was the stopwatch; Taylor was concerned primarily with reducing process times. The Gilbreths, in contrast, sought to make processes more efficient by reducing the motions involved. 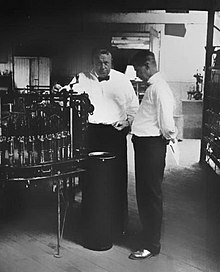 They saw their approach as more concerned with workers' welfare than Taylorism, which workers themselves often perceived as concerned mainly with profit. This difference led to a personal rift between Taylor and the Gilbreths which, after Taylor's death, turned into a feud between the Gilbreths and Taylor's followers. After Frank's death, Lillian Gilbreth took steps to heal the rift; however, some friction remains over questions of history and intellectual property. In conducting their Motion Study method to work, they found that the key to improving work efficiency was in reducing unnecessary motions. Not only were some motions unnecessary, but they caused employee fatigue. Their efforts to reduce fatigue included reduced motions, tool redesign, parts placement, and bench and seating height, for which they began to develop workplace standards. The Gilbreths' work broke ground for contemporary understanding of ergonomics. Frank and Lillian Gilbreth often used their large family (and Frank himself) as guinea pigs in experiments. Their family exploits are lovingly detailed in the 1948 book Cheaper by the Dozen, written by son Frank Jr. and daughter Ernestine (Ernestine Gilbreth Carey). The book inspired two films of the same name. The first, in 1950, starred Clifton Webb and Myrna Loy. The second, in 2003, starred comedians Steve Martin and Bonnie Hunt, and bears no resemblance to the book, except that it features a family with twelve children, and the wife's maiden name is Gilbreth. A 1952 sequel titled Belles on Their Toes chronicled the adventures of the Gilbreth family after Frank's 1924 death. A later biography of his parents, Time Out For Happiness, was written by Frank Bunker Gilbreth, Jr. alone in 1962. The award for lifetime achievement by the Institute of Industrial and Systems Engineers (IISE) is named in Frank and Lillian Gilbreth's honor. Frank Bunker Gilbreth (1909). Bricklaying System. The M.C. Clark Publishing Co.
Frank Bunker Gilbreth (1911). Motion Study: A Method for Increasing the Efficiency of the Workman. Introduction by Robert Thurston Kent. D. Van Nostrand Company. Frank Bunker Gilbreth (1912). Primer of Scientific Management. D. Van Nostrand Company. Frank Bunker Gilbreth; Lillian Moller Gilbreth (1916). Fatigue Study, the Elimination of Humanity's Greatest Unnecessary Waste: A First Step in Motion Study. Sturgis & Walton Company. Frank Bunker Gilbreth; L. M. Gilbreth (1917). Applied Motion Study: A Collection of Papers on the Efficient Method to Industrial Preparedness. Sturgis & Walton Company. ^ Ford, Daniel N. (1995). "Frank Gilbert, 1868-1924, American engineer" (PDF). In Emily J. McMurray; Jane Kelly Kosek; Roger M. Valade (eds.). Notable Twentieth-century Scientists: F-K. Gale Research. pp. 759–760. ISBN 978-0-8103-9183-3. ^ a b Urwick, L.F.; E.F.L. Brech (2003) . "Frank Bunker Gilbreth (1868-1924)". In Michael C. Wood; John Cunningham Wood (eds.). Frank and Lillian Gilbreth: Critical Evaluations in Business and Management. Taylor & Francis. pp. 49–64. ISBN 978-0-415-30946-2. ^ Sheldrake, John (2003). "The Gilbreths and motion study". Management Theory (2nd ed.). Thompson Learning. pp. 27–34. ISBN 1-86152-963-5. ^ "Simmons Hardware Company Warehouse - National Register of Historic Places Registration Form". National Park Service. 28 February 2008. Retrieved 9 May 2016. ^ "Maj. Frank B. Gilbreth". The Washington Post. June 15, 1924. Retrieved 2008-07-08. ^ Price, Brian (1992). 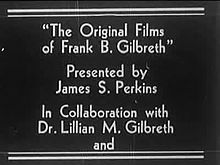 "Frank and Lillian Gilbreth and the Motion Study Controversy, 1907-1930". In Daniel Nelson (ed.). A Mental Revolution: Scientific Management Since Taylor. Ohio State University Press. pp. 58–76. ISBN 978-0-8142-0567-9. ^ a b Saxon, Wolfgang (20 February 2001). "Frank Gilbreth Jr., 89, Author Of 'Cheaper by the Dozen'". The New York Times. Gilbreth, Frank Jr.; Ernestine Gilbreth Carey (2003) . Belles on Their Toes. HarperCollins. ISBN 0-06-059823-9. Gilbreth, Frank Jr.; Ernestine Gilbreth Carey (2002) . Cheaper by the Dozen. HarperCollins. ISBN 0-06-008460-X. Townsend, Reginald T. (July 1916). "The Magic of Motion Study". The World's Work. 32 (3): 321–336. 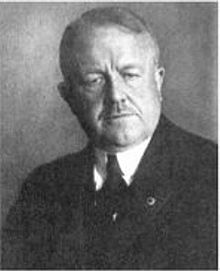 Wikimedia Commons has media related to Frank Bunker Gilbreth. Wikiquote has quotations related to: Frank Bunker Gilbreth, Sr.
Mendes, Joanne; Mary Sego (18 February 2010). "Finding Aid to the Gilbreth Library of Management Papers" (PDF). Purdue University Libraries. Archived from the original (PDF) on 3 January 2016. Mendes, Joanne (14 September 2012). "Inventory to the Frank and Lillian Gilbreth Papers, ca. 1869–2000" (PDF). Purdue University Libraries. Archived from the original (PDF) on 7 May 2016. "The Gilbreth Network". Archived from the original on 6 April 2012. "The Gilbreth 'Bug-lights', by Frank B. Gilbreth Jr. Originally published in the Historic Nantucket, Vol 39, no. 2 (Summer 1991), p. 20–22.